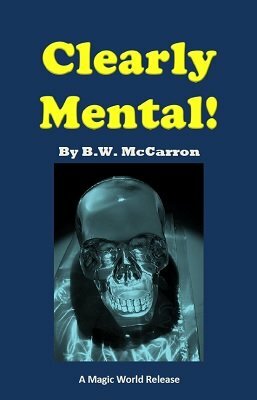 Clearly Mental contains 11 entertaining mental routines, including a subtlety used by one of America's most prominent performers to ensure that a beautiful woman is selected as a volunteer. Inside these 58 pages, McCarron explains not only routines, but 30 additional ideas for coming up with your own custom-crafted effects. The Name Game - Reveal the names two spectators are trying hard not to think of. Easy Money - Two spectators take turns attempting to exchange their $1 bill for a $5, $20, or $100 bill. Autograph Party - Audience members write the names of their favorite celebrities on billets. These are collected and one drawn in random fashion. The mentalist reveals all. Is instantly repeated with a different result. Three On A Match - Ten spectators draw folded slips bearing the numbers 1, 2, or 3. The mentalist reveals the total of the numbers, then identifies who drew what number. She's Clearly Beautiful - Guarantees that the most beautiful lady in the audience is selected as a volunteer without hurting the feelings of others who would like to participate. Hyp Pointer - Routine of pseudo hypnotism. Or an isidious way to invite multiple stooges to the stage from an apparently fair selection process. Russian Roulette - Secret agent themed game of Russian Roulette. Turn Of A Friendly Card - Three cards are selected that match the performer's previously mailed prediction. I've Got Your Number - Two spectators and a psychic telephone operator reveal the future of customer service. A great effect for corporate shows. Telepathic Juke Box - A telepathic jukebox of the future that plays the mentally selected songs of two spectators. The Only Good Apple Book Test - Three spectators select words from an unprepared book. They match the performer's prediction! This efect alone previously sold for $15. Also included is a step-by-step method, illustrated with numerous color photos, for constructing a three-chambered clear forcing bag. McCarron's force bags have been used on TV by numerous performers. He shares his manufacturing secrets for the first time. 1st edition 1989, 2nd edition 1998, 1st digital edition 2015, 58 pages.